Associated Bank colleagues (from left to right), Kevin Ress, Matt Meyer and Joe Smits, in Green Bay accept a Patriot Award by the ESGR. 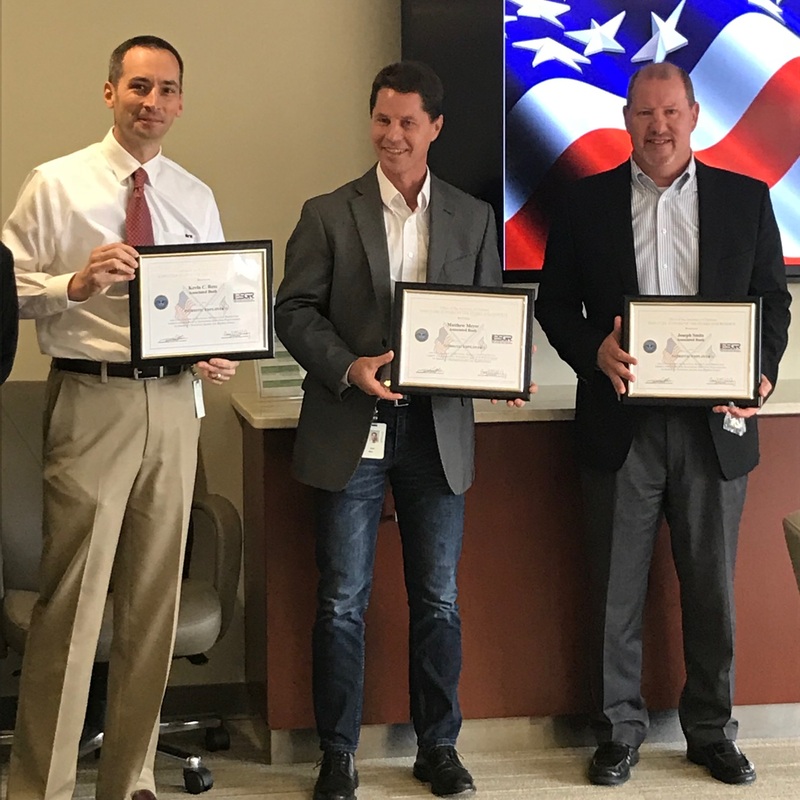 Four Associated Bank leaders in Green Bay and Milwaukee were recently recognized with a Patriot Award by the Employer Support of the Guard and Reserve (ESGR), for supporting their colleagues serving in the National Guard or Reserve while on military leave. ESGR, an agency of the Department of Defense, recognizes supervisors for efforts made to support citizen warriors through a wide-range of measures including flexible schedules, time off prior to and after deployment, caring for families, and granting leaves of absence if needed. Tom Irizarry, information security risk analyst at Associated Bank in Green Bay, nominated his supervisors, Kevin Ress, Matt Meyer and Joe Smits for the award. Irizarry serves as Sergeant First Class in the U.S. Army Reserve and recently returned from deployment in the Baltic States, where he and his team supported Atlantic Resolve, a demonstration of ongoing U.S. commitment to enduring stability in Eastern Europe and solidarity with NATO allies. Associated Bank supports veterans and military personnel through a variety of benefits, such as leave time, retention of benefits and full pay for colleagues on training and active military leave. In addition, the Deployment Trip Program provides financial assistance to colleagues visiting a loved one prior to deployment. Sovaja Knox, security guard at Associated Bank in Milwaukee and an active member of The United States Marine Force Reserve, also nominated and recognized his supervisor, Kyle Kappel, with a Patriot Award. In addition, through Nov. 18, Associated Bank branches recognized local heroes by displaying military photos, uniforms and memorabilia in their lobbies. Customers, colleagues, family members and friends who are veterans or active-duty military personnel were encouraged to bring in memorabilia and photos of themselves in uniform.